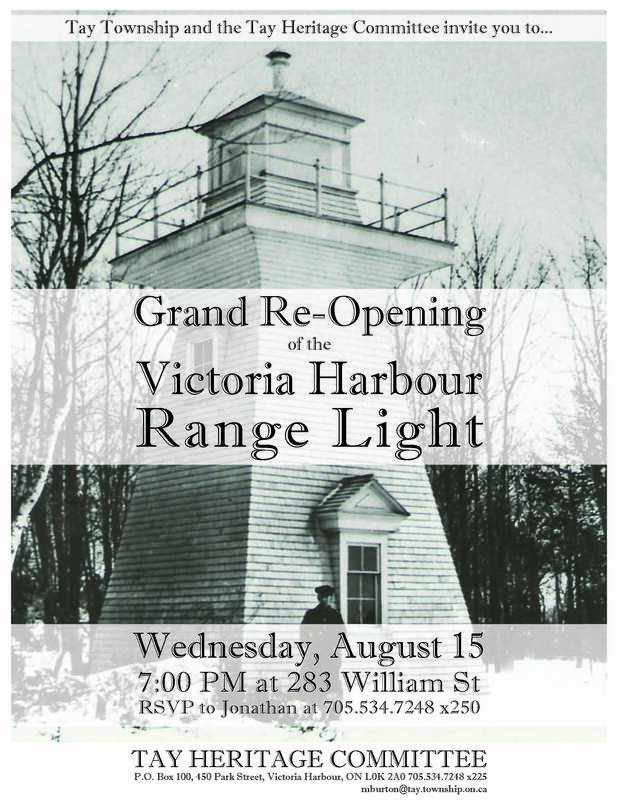 After an extensive rebuilding project last year, Tay Township is pleased to announce that the Victoria Harbour Range Light is reopen for public viewing. To celebrate the achievement, Tay Township and the Tay Heritage Committee are holding a grand reopening ceremony on Wednesday, August 15 at 7:00 pm. The event will take place at the base of the range light at 283 William St. For access to the site, please refer to the following map – Range Light Access. All are welcome to attend. If you have any questions, feel free to call Jonathan at the Tay Township office at 705-534-7248 ex. 250. We look forward to seeing you there. This entry was posted in community event, heritage, history, Victoria Harbour, World War One, World War Two and tagged Canadian Pacific Railway, Georgian Bay, Great Lakes, Huronia Museum, local history, Ontario, Port McNicoll, preservation, range light, Simcoe County, SS Keewatin, Tay Township, Victoria Harbour. Bookmark the permalink.